Tennis remains as popular as it has ever been, and even with the passing of the sport’s “Golden Age”, there is no shortage of players who manage to make headlines. Among today’s most popular players are Roger Federer and Novak Djokovic, and it is these two that we compare here. 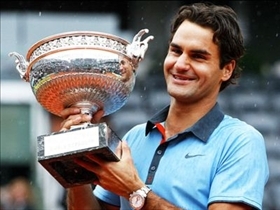 Roger Federer was born on August 8, 1981. A Swiss tennis player who held the top spot for an astounding 237 consecutive weeks, Federer is currently ranked the second topmost tennis player in the world by the Association of Tennis Professionals or ATP. Federer is considered by many to be the greatest tennis player in history. Novak Djokovic was born on May 22, 1987. Djokovic hails from Serbia, and is currently ranked the World No. 3 by the ATP. Roger Federer is most notable for having set the record for the most Grand Slam singles titles in the male division, which he has won 16 times. Federer is also one of only seven male tennis players to have won a career Grand Slam, and one of three players to have done so on clay, grass and hard tennis courts. Federer has also played in 22 career Grand Slam finals, and holds the record for qualifying in the semi-finals of 23 Grand Slam tournaments consecutively over more than five years, from the Wimbledon Championships in 2004 to the Australian Open in 2010. In addition to these and other achievements at Wimbledon and the Australian Open, Federer has also won a gold medal at the 2008 Summer Olympic Games, in a victory he shared with Stanislas Wawrinka. Novak Djokovic for his part has won one Grand Slam singles title, which he did so at the Australian Open in 2008. This win made Djokovic the first Serbian tennis player to win Grand Slam singles title, as well as the youngest player to have qualified for the semifinals rounds of all four Grand Slam events in the open era. Djokovic has also achieved victories at the 2007 and 2010 US Open, and a bronze medal at the Olympic Games of 2008. Roger Federer and Djokovic have actually faced each other on the courts a total of 19 times in a period spanning four years. At present, Federer leads with a score of 13 wins to Djokovic’s 6. Djokovic's biggest victory over Federer happened during the Australian Open of 2008, where he managed to beat Federer in the semi-finals in straight sets, effectively halting Federer's ten consecutive Grand Slam finals winning streak. Djokovic's last win over Federer occurred at the US Open of 2010, where he beat Federer in the semi-finals in five sets. At the most recent face-off between the two, Federer won over Djokovic in the finals and semi-finals rounds of the ATP World Tour Finals. Who is the best tennis player?